The Miss Black America pageant hasn’t really impacted on the soul scene very much, an interesting if deeply flawed LP by the wonderful Moments and a rather mawkish Curtis Mayfield song notwithstanding. 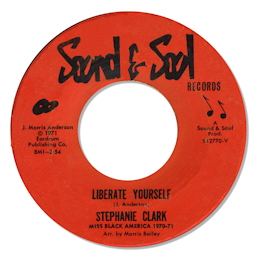 But this track by the 1970 winner Stephanie Clark is in a different class. Ms Clark came from Georgia originally but was living in Arlington, VA and studying psychology at Ithaca college in New York when she won the title. 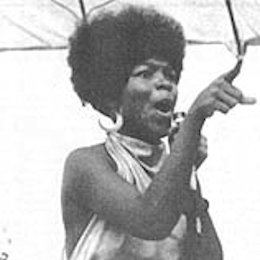 A woman of strong and independent ideas she went on several trips to Vietnam to entertain the troops, and later founded My Daughter's Keeper, a non-profit organization created to provide support and resources to mothers/caregivers and daughters. She subsequently wrote a well-received book on her experience of being a single mother. Although she sang in a lot of clubs over the years I think this is her only record released. A pity as she has a really big voice which she controls well and her command of dynamics is first rate on “Liberate Yourself”, a fine song with just the sort of lyric she would have wished to be associated with. The instrumentation was recorded in Philly of course, that sound is unmistakeable.